REGISTER BY 9/8 FOR $10...$20 IF YOU REGISTER LATER!! MANY FAMILIES STRUGGLE TO MAINTAIN THEIR CONNECTION. WE PROVIDE A ROADMAP FOR FAMILIES TO THRIVE AND STAY STRONG. 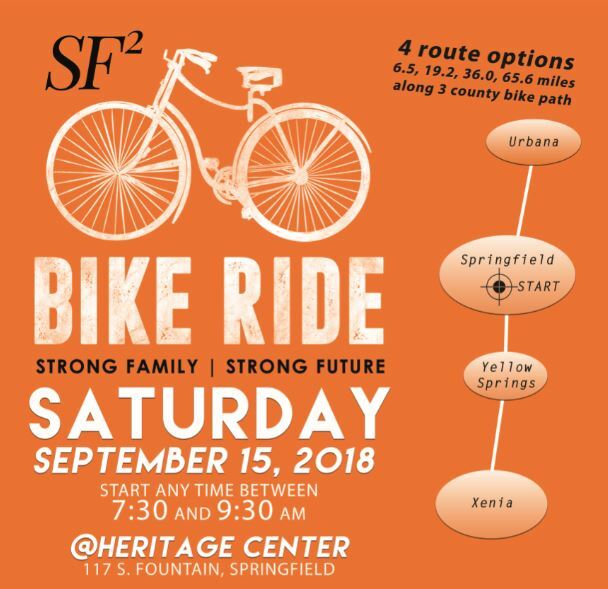 Enjoy miles of scenic bike trails through 3 ohio counties (Clark, Champaign and Greene) while supporting a worthy cause for strong families and strong futures. Video is a Facebook Live of the DeHart family from the 2017 ride that started and ended at The Heritage Center in Springfield. Start Times and Location: Start anytime between 7:30 and 9:30am (Check in for 6.5 mile route after 9a) from Heritage Center. Staffed and stocked rest stops plus 1 roving support vehicle will be available until 2:30pm so plan accordingly. Route Descriptions: Mostly on the trail; select from 4 shorter to longer mileage routes. Refreshment breaks/stations will have restrooms, water, lunch and snacks. Free pie and ice cream at the finish line. Children 13 or younger ride free. "Register" to ride; "Sponsor" to purchase an ad; "Make a Pledge" to support a rider or team.